I tell you the truth, anyone who believes has eternal life. Yes, I am the bread of life! Your ancestors ate manna in the wilderness, but they all died. Anyone who eats the bread from heaven, however, will never die. I am the living bread that came down from heaven. Anyone who eats this bread will live forever; and this bread, which I will offer so the world may live, is my flesh. The baby boomer generation was the first generation raised with a constant stream of television programming. Programming that poured into our living rooms depicting perfect families and perfect lives. (Do you remember the advent of “Living Color”? ) The television world of sit-coms and dramas resolved all major relationship problems in thirty minutes to an hour. The perfect world of television idealized life for the Baby Boomer. This explains the Baby Boomer inability to cope with the dogged problems of living in a fallen world. The Baby Boomer generation was the first generation to be fed a constant diet of fast food: MacDonalds, Taco Bell, and Dairy Queen for all. We were no longer a culture that prepared meals. We ate on the run to re-fuel. Meals were no longer for fellowship or a moment to thank God for his bountiful provision. We became a generation which no longer asked if we will eat, but only what and when we will eat. Many of us lived off hamburgers and french fries and now our coronary arteries display the results. Nutrition class in high school became nap time for many of us. I can remember many a mom saying, “If you don’t stop eating all those hamburgers, you will just become one big hamburger.” In unison, the mothers around the country declared, “You will become what you eat.” Little did they know how true that warning was for our lives and society. 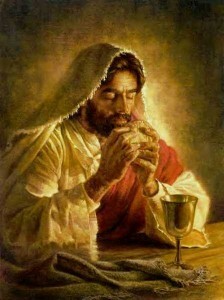 Indeed, the scriptures declare that, “we are what we eat.” When we partake of the Body and Blood of our Lord in the Lord’s Supper, Christ is present (see Koinonia and the Lord’s Supper). As we partake of him by faith, he transforms us and the whole congregation. Transformation of the bread and wine by the mysterious action of the Holy Spirit into the Body and Blood of Jesus. Transformation of the Christ-follower by the work of the Holy Spirit into the image and likeness of Christ. Transformation of the congregation into the people of God bringing them into heavenly worship of our Triune God by the transporting work of the Holy Spirit. We are are what we eat for during the partaking of the Lord’s Supper, we are being transformed into the likeness of Christ. What nourishes and transforms us at bread and wine is the disclosure of the whole story of God-creation, incarnation, re-creation-which takes up residence inside of us as we take and eat, take and drink. For in this symbol a reality is present-the divine action of God redeeming his world through Jesus Christ. . . . We become what we eat-living witnesses to Christ who lives in us. Robert E. Webber, Ancient-Future Worship: Proclaiming and Enacting God’s Narrative (Grand Rapids: Baker Books, 2008), 146. This entry was posted in Holy Eucharist, Robert E. Webber and tagged Holy Eucharist, Robert Webber on April 29, 2010 by GlennDavis.